Advantech, a leading embedded computing and intelligent applications provider, today announces the release of AIMB-217, a new industrial-grade fanless Thin Mini-ITX motherboard. With the latest Intel® Pentium®, Celeron®, and Atom® N4200/N3350/x7-E3950 processors (formerly Apollo Lake processor), AIMB-217 provides 30% CPU performance enhancement and 45% graphic performance boost compared with previous generations, and it comes bundled with Advantech’s exclusive WISE-PaaS/RMM software suite for remote device management. Moreover, AIMB-217 offers significant graphics performance boost up to 4K2K with a low power CPU TDP of 6~12W only. Furthermore, AIMB-217 supports extended operating temperatures of -20~70 °C, which makes it suitable for semi-outdoor applications. 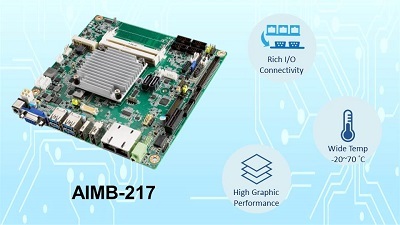 AIMB-217 adopts a rich array of I/O interface including: dual GbE LAN ports, 4 x USB 3.0, 8 x USB 2.0, 2 x SATAIII. For expansion, AIMB-217 supports 1 x PCIe x1, 1 x M.2 (E key), and 1 x full-size MiniPCIe (colay mSATA) w/SIM card holder for flexible modular add-on card installation. Moreover, AIMB-217 supports 6 x COM (COM3 supports RS-232/422/485 auto-flow control, COM 6 supports 5V/12V), which benefits users who want to connect devices without additional external power supplies and those needing reliable data transfers over long distances. Asides from above I/O capacity, AIMB-217 can operate under wide temperature settings ranging from -20~70 °C, making it an ideal solution for use in semi-outdoor environments such as airports or train stations with passenger information systems, signage walls and kiosks, as well as vending machines located outdoors. AIMB-217 integrates Intel Gen 9 graphics engine, with up to 18 EUs, which improves throughput and media acceleration, and 4K2K display resolution. With the new graphics core, AIMB-217 provides rich display interfaces such as VGA, DisplayPort1.2, HDMI1.4, LVDS, and eDP. It can support three simultaneous, independent display outputs, deliver stunning graphics and media performance (DirectX 12.0, OpenGL 4.3, OpenCL 2.0 Full Profile) and the 4096 x 2160 high resolution output satisfies the needs of high-quality display applications, which makes it ideal for gaming and digital signage customers who require a slim size solution with high resolution graphics and up to 3 independent display output. AIMB-217 bundles with Advantech’s exclusive IoT software WISE-PaaS/RMM, which is a smart and value added software framework that provides remote device management and system recovery powered by Acronis, and system protection powered by McAfee to ensure reliable operation, allowing users to easily monitor, configure, control, and even recover multiple systems through a single console from any remote site. THIN and fanless Mini-ITX design. Extended temperature -20~70 °C support (only for AIMB-217Z). Intel® Pentium/Celeron/Atom® N4200/N3350/x7-E3950 processor support. Supports dual channel DDR3L-1866 204-pin SODIMM sockets up to 8 GB. Intel® Gfx 9 supports DX12, OpenCL 2.0, OpenGL 4.3, HW decode: H.265, HW encode: H.264. Supports triple simultaneous displays: HDMI1.4b, VGA (or eDP), DisplayPort1.2 (or LVDs). Rich I/O & expansion options: 4 x USB 3.0, 8 x USB 2.0, 2 x SATAIII, 6 x COM ports, 1 PCIe x1, 1 Mini PCIe sockets (F/S, colay mSATA), and 1 M.2 (E key, type: 2230), and 8-bit GPIO.